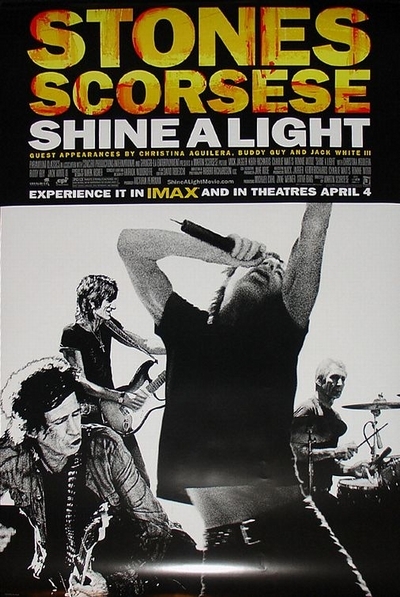 Story: An Academy Award-winning filmmaker and the world's greatest rock n' roll band unite to bring audiences the year's most extraordinary musical film event, "Shine a Light," to theatres everywhere. Martin Scorsese's concert documentary "Shine a Light" shows the world the Rolling Stones as they've never been seen before. Filming at the famed Beacon Theatre in New York City in fall 2006, Scorsese assembled a legendary team of cinematographers to capture the raw energy of the legendary band. Oscar-winning cinematographer Robert Richardson ("The Aviator," "JFK") supervised the camera team comprised of several highly acclaimed directors of photography, including Oscar winner John Toll ("The Last Samurai," "Braveheart"), Oscar winner Andrew Lesnie ("The Lord of the Rings" trilogy, "King Kong"), Oscar nominee Stuart Dryburgh ("The Piano," "The Painted Veil"), Oscar nominee Robert Elswit ("Magnolia," "Good Night and Good Luck"), Oscar nominee Emmanuel Lubezki ("Lemony Snicket's A Series of Unfortunate Events," "Sleepy Hollow") and Ellen Kuras ("Summer of Sam," "Eternal Sunshine of the Spotless Mind"). The film was edited by David Tedeschi, who most recently worked with Scorsese on the acclaimed Bob Dylan documentary "No Direction Home: Bob Dylan."